Jerry Falwell Jr. Compares Hillary Clinton To Hitler - Joe.My.God. 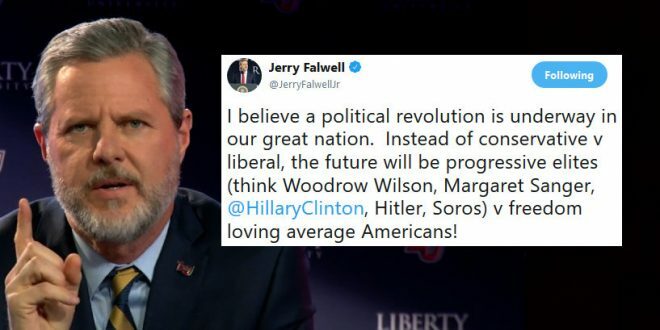 Jerry Falwell Jr., president of Liberty University, the famous Christian college, has labelled Nazi dictator Adolf Hitler a progressive and suggested he was a liberal. In a series of tweets Thursday night, Falwell defended President Donald Trump and attacked Trump’s perceived opponents. Falwell tagged Hillary Clinton in his tweet comparing her to Adolf Hitler. She has not yet responded. In earlier tweets, Falwell promoted Fox News personality Jeannine Piro’s new book and Dinesh D’Souza’s new film, which has been widely panned as right-wing propaganda and bad history.